It just wouldn’t be Christmas in the U.K. if, over the holiday break which now extends to the New Year, ‘The Sound of Music’ or ‘Mary Poppins’ didn’t feature on the terrestrial TV schedule, usually on Christmas Day itself. In 2003 there was a minor shake up and we got George Cukor’s 1964 film version of Lerner and Loewe’s musical ‘My Fair Lady’. The leads were taken by Rex Harrison as Proff. Higgins (the part James Cagney took on Broadway), with the eponymous lady herself being the delectable Audrey Hepburn, admirably showing off Cecil Beaton’s couture, but with her singing dubbed to the voice of Marnie Nixon. The part of her father was acted and sung by Stanley Hollway and included the memorable song ‘Get me to the Church on time’. The film got 7 ‘Oscars’ and Holloway found himself re-discovered in the U.K., where he had been largely known for his work on the variety stage, particularly for his monologues, many of the most famous and memorable of which are found on this disc. Born in 1890 Holloway could well be described as a polymath entertainer. He appeared alongside Sir Laurence Olivier in ‘Hamlet’ (1948) before creating dustman Doolittle on Broadway at the age of 65 and where his daughter was Julie Andrews, who did sing her own words! In his early twenties Holloway had fancied himself as a budding operatic baritone and went to Milan, at his own expense to study. However, World War 1 saw him conscripted into the army and he returned to the stage to co-write and star in the ‘Co-optimists’, a revue that ran for six years at the end of which he returned to the variety theatre performing rhyming monologues including ‘Sam. Pick Oop Tha’ Musket’, which he wrote himself (tr.2). Hearing him one night, George Marriot Edgar, a writer and fellow performer in the ‘Co-optimists’, provided Holloway with the script of ‘The Lion and Albert’ (tr.1), which became one of his most popular monologues. Holloway’s style was to present the monologues, with piano accompaniment, in a Lancashire dialect, one not so broad as to be incomprehensible in Cheshire and points south, but inflected and intonated with his innately musical baritone and enunciated with perfect diction. As the monologue evolves the characters come vividly to life as one listens, particularly as they convey so much of the social mores of the time. The wife is always mother (trs.1. 4. 12) the army officer is very public school whist soldier Albert is a down to earth working class with perhaps a touch of revolutionary Marxism in his non-conformist soul (tr.2 and 13). Even Noah speaks better than another Sam as he tries to negotiate the price of Maple, to furnish ‘The Ark’, down from ‘three’apence a foot’ (one and a half pre-decimalisation pennies) Trs. 3. 9. The humour of the situations was not so much in the remote possibility of the happenings being true, but the identification of the audience with the situation and the reaction of the characters that they had come to know so well. Not all the follow up monologues are of the quality of what might be called the first in the series. This is particularly true, I felt, in respect of Noah and Sam Oglethwaite, whilst Albert in particular, but also Sam Small, the soldier, fare better. 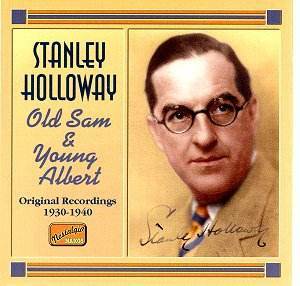 The recordings include here date from ‘Old Sam’ of 27th October 1930 to ‘Yorkshire Pudding’ (tr.10) and ‘Brown Boots (or as Holloway says it’ Brahn Boots’) tr.14, set down on 29th October 1940.The later recordings have more presence than the earlier, all are clear and an excellent representation of the Holloway my minds ear carries from performances I heard from him in the theatre and on the radio over fifty odd years ago. This collection of Holloway, and his famous monologues, is but one facet of the artistry and creative imagination of one of the 20th centuries greatest entertainers. However, it should provide happy recollection to many oldies and enjoyment to a younger generation who perhaps pass the credit list of ‘My Fair Lady’ without realizing the name and the important part Holloway played in keeping British spirits alive and kicking in the dark days of World War 2 and the years preceding and following. Highly recommended.